Whenever I dine out, I always strive to keep the bill under $20 per person, tip included. Of course, it all depends on the quality, décor and type of restaurant, but for most middle-of-the-road type establishments, getting out with a bill of under $40 for two is quite an accomplishment -- and thoroughly doable. Almost all restaurants keep track of a server's PPA, which stands for Per Person Average. It's just what it sounds like. Servers get ranked according to how much they can squeeze out of each customer. Their tip depends on their PPA and a restaurant's overall sales depend on servers' PPAs. The servers at the bottom of this list get an earful as to why they're not selling more side salads, alcohol, desserts and the like. Therefore, it's a battle between me and my server -- and to the victor goes the moolah. As much as my waiter tempts me to go for all the "add-ons," I in turn fight to keep the tab down. Below are some wise ways to keep that bill in check, and those bills in your wallet. 1. Forget about the "Joneses"
Unless I am at a business dinner, I could care less what other people think of me when I order -- or for that matter, not ordering. If I'm so worried about what my friends think, maybe they're not really my friends. As long as I am content and have followed the proper tipping etiquette guidelines, I'm not going to worry. To me, this is the number one way to keep your bill in line, hands down. It could be bread and butter, chips, or just about anything. Take full advantage of these freebies! Am I saying to stuff yourself silly with bread and butter so much that you don't even order an entrée? Of course not. But if restaurants give you some food that comes out before your main meal, isn't that kind of like an appetizer? Do yourself a favor: Fill up on the chips and salsa or bread and butter within reason and skip the paid appetizer. And don't be shy about asking for a refill. Until recently, many national chains did their best to avoid offering coupons. Well, guess what? A lot of them have jumped into the coupon game with some awesome offers, often found via the Entertainment Book. Chains such as Longhorn and Outback that had never offered paper discounts now have coupons appearing online -- and in print ads too. Keep an eye out in your Sunday paper and email inbox and you just might find a coupon to your favorite establishment. Also: A lot of restaurants offer discounts to first-time customers, so don't be shy about trying a new place. You may even want to go to the restaurant website and subscribe to their email newsletter for exclusive savings. Another great site is Groupon,which offers some a time-limited discounts to a wide variety of restaurants, including some of the more upscale ones. At many restaurants, one entrée easily feeds two people. So, why not split an entrée with someone? This especially works well if you have children, because you can always pull them into it. You can say you're sharing with them because they're not big eaters. You can also say you're in a hurry or that you're not that hungry: whatever works for you. In my case, it's very rare that my wife and I order two full entrees when we eat out. It's simply too much food. Even with all the techniques that I use to prevent ordering too much food, we invariably still end up with leftovers. I always ask for a doggie bag. It makes for a perfect lunch the next day at work or sometimes even another full meal the next evening. One other quick tip here: I'd suggest asking for the takeout box and bag so you can pack up your own leftovers at the table. It's a lot more sanitary than what often goes on in the kitchen. Waiters and waitresses know what I'm talking about. I worked in the restaurant biz for close to 20 years, so the last thing I'm advocating is an unnecessary complaint. On the other hand, you're paying good money for your food and service. If you legitimately don't feel like you got your money's worth, don't be afraid to speak up. It bothers me to no end when I hear of after-dinner conversations like "they really kind of burnt my chicken, but I didn't want to say anything." Remember: You can complain, and still be nice about it. 10. Don't just sign your bill -- look at it! There are even more great ways to save money while eating out. Dining out is one of the favorite entertainment options of many American households, but fast becoming a luxury in our recession. So saving as much as you can when you dine out can increase your chances to enjoy this American pastime. With all this said, don't underestimate how much money you can save by eating at home more often -- especially through the use of some great meal budgeting services like E-mealz. 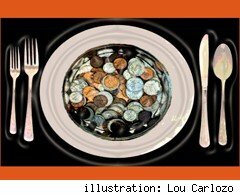 Do you have any additional tips for saving money while eating out? As always, your comments and lively dialogue are greatly appreciated. David Bakke is a columnist for the Money Crashers personal finance blog. He covers various finance-related topics including saving money and getting the most bang for your buck, getting and staying of of debt, building long-term wealth, and more.